This is a 1920 Montblanc #8 Rouge et Noir Safety eyedropper-fill in Black Hard Rubber. “Rouge et Noir,” introduced in 1909, was the first line of pens produced by the Simplo Pen Company. 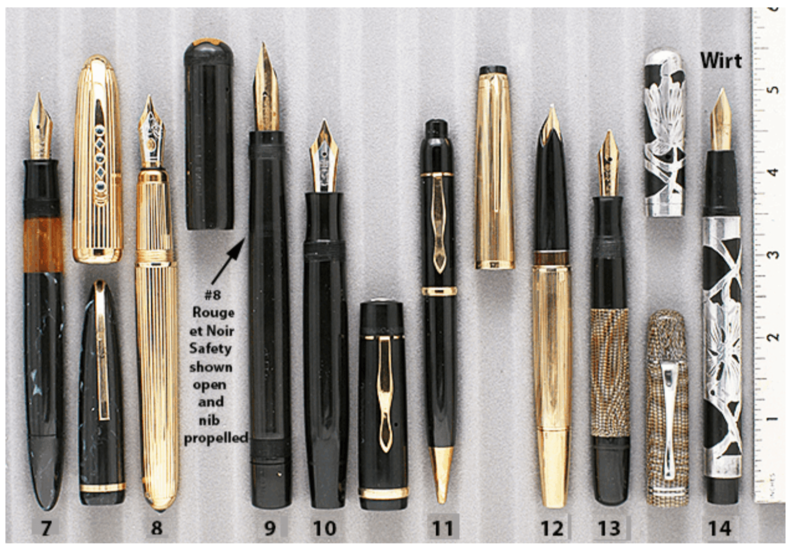 Their second line of pens was the “Montblanc,” introduced a year later. In 1934, in recognition of the success and fame of the Montblanc line, the Simplo Pen Company was renamed “Montblanc Simplo GMBH”. The Rouge et Noir line continued until at least 1923. In the model offered here, note the rare horizontal chasing of the inner cap (just below the red star) and at the joint between the barrel and turning knob. Simplo eventually replaced this with vertical chasing, still used today. Large, “MONTBLANC 8 14CT” nib (fine, triple-flexible), also imprinted at the heel (out of view), “Hamburg,” correct for a 1920’s Rouge et Noir. Cap with “Rouge et Noir” imprint and three vent holes (many caps have four vent holes). Barrel imprint, “Rouge et Noir Original Pat. Ap.” (not all easily readable) and an owner’s imprint, “–ilio De Marchi Gherini” (beginning few letters unreadable). The Italian owner’s imprint is not surprising as all post-WWI Rouge et Noir pens were exported for sale in Italy. Turning knob imprinted “8M.” Some distress to the lower knurling and wear here and there, commensurate with a 100 year old pen. The largest size made of this extremely rare and highly desirable pen! Pen was used during its heyday, with dried ink inside the barrel. Unrestored. Check out our Catalog to view this item’s availability! Item #9 in Catalog #86. This entry was posted in Vintage Pen, Vintage Pens and tagged Catalog, Catalogs, Extraordinary Pens, Fountain Pens, Go Pens, GoPens, Montblanc, Vintage Fountain Pen, Vintage Fountain Pens, Vintage Pen, Vintage Pens. Bookmark the permalink. Follow any comments here with the RSS feed for this post. Post a comment or leave a trackback: Trackback URL.